Happy Holidays… SAVOR the Food and More! Simplify. Are you always asking yourself “What should I be eating?” Michael Pollan in his book In Defense of Food gave an excellent answer to this exact question : “Eat food. Not too much. Mostly plants.” When he talks about food he is referring to the food our grandparents raised, harvested, and made. Slow down. The holiday season is a busy one, but just as we find ourselves preaching to our children “remember the real reason for the season”, we may need to remind ourselves of the same message. When it comes to meal time, stop what you are doing, sit down, breathe, turn off the media, taste your food as you eat and enjoy the company that you sit with (even if it is just yourself!). Be conscious. Practice being conscious of what you are eating and the nutrition and/or pleasure the food is giving you. Are you eating the holiday cookies because they are sitting on the counter staring at you and you are bored? Are you so busy while eating that you do not even taste them? Or are you eating them because they are freshly baked homemade cookies that you truly love. How about a handful of berries? Do you taste the juices from the fruit? Immerse yourself in your food. Be part of the cooking process. Grow a garden. Meet the farmers who grow and raise your food. Understand how the food that you eat comes to your table. Respect the process of cooking and preparing food. Enjoy the food served. Be picky. Decide on the foods that you really enjoy eating, and do so in moderation. Be choosy, but when you do decide to eat your favorite dessert, do so without guilt and stop counting every calorie. Instead really taste the food, enjoy the flavors and the taste. Spice it up. Spice up your diet not only with fresh herbs and spices but also with variety! Keep your flavor profile interesting by adding new foods to your menu. If you feel your are in a meal time rut, pull out a new cookbook to become inspired. One of my favorite cookbook series is by Ellie Krieger, a registered dietitian with her own cooking channel on the Food Network. Her cookbook So Easy is filled with simple yet flavorful recipes for the whole family! Make time for the people who are important to you. Live within your means and don’t overspend. Make time to slow down, rest, and unwind. Journal the happy memories in your everyday life either through photos, writing, or even a blog. Give to others. Giving to others means more than just giving presents. Share the gifts and talents you were born with with those around you. Release any hurts or pains of your past. Be quick to forgive and forget. Be grateful for all that you have and stop comparing yourself and your life to others. Preheat the oven to 400ºF. Open the sheet of puff pastry and place on a sheet of parchment paper over a rimless baking sheet (or place the pastry on an overturned rimmed baking sheet). Using the tip of a small sharp knife, score a 1/2-inch border around the edge of the pastry rectangle, being sure not to cut all the way through the dough. Using a fork, thoroughly pierce the area inside the border. Bake for 10 minutes more. (The pastry will puff.) Meanwhile, remove from the oven. Using the fork, piece the area inside the shell to deflate it, leaving the border intact. Sprinkle the pierced area with the Parmesan cheese, and then the goat cheese. Return to the oven and bake until the pastry border is puffed and golden brown, about 10 minutes more. Meanwhile, make the balsamic glaze: Bring the balsamic vinegar and honey to a boil in a small saucepan over high heat. Cook until reduced by half, about 5 minutes. Keep warm. Keep warm. 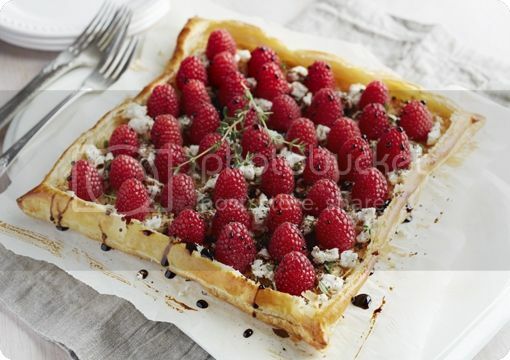 Arrange the raspberries over the warm cheese. Sprinkle with the thyme and grind the pepper on top to taste. Using a serrated knife, cut in half crosswise, and then into 6 to 8 strips. Transfer to plates, drizzle with the glaze, and serve warm.